Not only are marigolds an attractive accessory, they’re also natural insect repellants. Placing a pot of them on the table will keep bees and other bugs from milling around your tasty 4th of July treats. 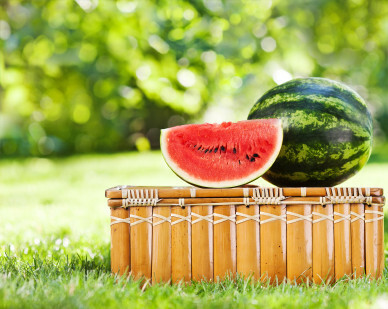 Speaking of treats, your guests won’t be the only ones attracted to your watermelon slices and potato salad. Keep bugs from sampling the spread by covering dishes with plastic wrap or aluminum foil. To keep ants from scaling the table, place slices of cucumber (which ants hate) on the ground surrounding its legs. Tip: If you don’t want to confuse your guests with strangely-placed vegetables, grate the cucumber into fine shreds so that it is camouflaged in the grass. Placing the garbage can near your eating area is a logical-but-buggy choice because trash is a major pest magnet. To spare your guests unnecessary swatting efforts, keep your waste covered and away from the action. Sage and rosemary smell dreamy to us, but they’re a bug’s worst nightmare. Placing these herbs directly on the coals of the grill when barbecuing (AKA “The BBQ Bomb”) will have your human guests gathering around and insects fleeing for the neighbors’ yard. If you have a garden, plan ahead and plant natural bug-repellants like lavender, citronella, spearmint and chrysanthemum so that they’ll be in full bloom by the time your party rolls around. Tip: If you’re late to the planting game, you can still buy these plants in pots and place them strategically around the yard. This entry was posted in Home Ownership, Local Info by remaxalliancevb. Bookmark the permalink.